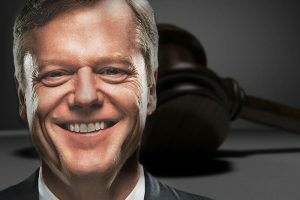 Massachusetts Governor Charlie Baker launched Thursday his own push to bring legal sports betting to the state with a bill calling for the authorization of wagering on professional sports. Gov. Baker’s bill joined a handful of legislative pieces that were introduced to the state Legislature earlier this week and are all aiming to legalize sports betting in one form or another. Rep. Brad Hill, Rep. Dan Cullinane, Sen. Brendan Crighton, and Sen. Michael Rush are all keen to bring the activity to Massachusetts. Under Gov. Baker’s bill, bettors would only be able to wager money on professional sports. Betting on collegiate and high school sporting events would be strictly prohibited. The piece of legislation authorizes the Massachusetts Gaming Commission to oversee and regulate the provision of sports betting on the territory of the state and to vet all license applicants. It should be noted that Gov. Baker has undertaken a slightly different approach in the legalization of the practice. His bill allows for both in-person and mobile betting. The state’s existing casinos – MGM Springfield and Plainridge Park Casino (as well as the soon-to-be-opened Encore Boston Harbor) will be able to form partnerships with betting providers to offer both retail and digital services. However, interested online gambling companies will, too, be able to apply for a license from MassGaming without having to partner any of the state’s existing land-based properties. While online operators will probably welcome that opportunity, it is believed that Massachusetts’ commercial casinos would be less enthusiastic. Under Gov. Baker’s bill, retail betting will be taxed at 10% on revenue, while online wagering will be taxed at 12.5%. Interested operators will have to pay an application fee of $100,000. Approved candidates will have to pay a $500,000 licensing fee that will have to be renewed every five years. Gov. Baker said yesterday that his legislation was modeled after New Jersey’s betting law. The latter state launched legal sports betting in June 2018, just weeks after the landmark SCOTUS ruling that lifted a federal ban on the activity. New Jersey offers both in-person and mobile betting. Digital betting accounted for approximately 63% of the overall betting handle of $1.2 billion the state’s licensed operators processed in the period between mid-June and December 31, 2018. As mentioned earlier, if passed, Gov. Baker’s bill would only authorize betting on professional sports. Other bills on the matter tabled in recent days include provisions allowing for betting on collegiate athletics or betting on collegiate sporting events taking place outside Massachusetts. Gov. Baker’s legislation does not propose an integrity fee/royalty for professional leagues. Rep. Cullinane’s bill, on the other hand, contains a provision that allows leagues to collect a fee out of the wagers placed on their games. Under Rep. Hill’s bill, tax revenues would go to a health insurance fund, an education fund, and a transportation fund. With the sports betting debate gaining momentum, Massachusetts could become the second state in New England to legalize the practice. Rhode Island went live with legal wagering late last year when its Twin River casinos in Lincoln and Tiverton launched their physical sportsbooks. State legislators are now pushing to bring mobile betting during the ongoing legislative session. The post Massachusetts Governor Moves to Legalize Sports Betting appeared first on Casino News Daily. The names of the players who will play the first televised WPT Season XVII final table are now known. Frank Stepuchin is leading the last six survivors in the WPT Gardens Poker Championship into the final stage of the tournament with a comfortable lead. The six remaining players represent the first delayed final table of a WPT Main Tour Main Event. The popular poker series announced last year that from the start of Season XVII all its televised final tables will be played at a later stage and at HyperX Esports Arena at The Luxor in Las Vegas. The televised final table of the WPT Gardens will be played on March 12 and will be filmed for FOX Sports Regional Networks. After four days of play at The Gardens Casino, Stepuchin emerged as the chip leader out of six remaining players. He bagged and tagged 4.065 million in chips when the final table was set and organizers stopped action. The player is now in possession of about 40% of all chips in play. He took the lead and cemented his position when he eliminated Toby Lewis, a three-time WPT final tablist. On what turned out to be the final hand of the night, Stepuchin moved all in with pocket fives on a [Jc][5h][2h][Kd][3d] board and Lewis called with [Kh][Jh] to hit the rail and miss the chance for another WPT final table appearance. Of the other five remaining players, Shannon Shorr sits closest to Stepuchin on the temporary leaderboard. The player collected 1.71 million, good for the second largest stack. Steve Sung bagged 1.58 million into the final table. Brent Roberts with 1.385 million, Ray Qartomy with 820,000, Jonathan Abdellatif with 555,000 were the other three players to make it to the final table of the WPT Gardens championship. Stepuchin and Abdellatif have both secured seats into their first-ever WPT final table, while Shorr Sung, and Qartomy will all make their fourth final table appearance in March. Roberts has one previous WPT final table to his name. The player also has one WPTDeepStacks title from a few years ago. If he takes down the WPT Gardens, he will become the first player to have ever won both a WPTDeepStacks and a WPT Main Event. All in all, the WPT Gardens Poker Championship, a $10,000 buy-in tournament, drew 253 entries who generated a prize pool of $2,428,800. The money was split into payouts for the top 32 finishers, min-cashes starting from $19,120. Each of the six finalists is guaranteed a minimum payout of $110,225. And the winner will walk away with the first-place prize of $548,825, including a $15,000 package into the season-ending Baccarat Crystal WPT Tournament of Champions. The post Frank Stepuchin Leads Final Table of WPT Gardens Poker Championship appeared first on Casino News Daily.